Prime Minister David Cameron has described a firefighters' strike in London on Bonfire Night in a row over contracts as "irresponsible". Labour leader Ed Miliband's spokeswoman also said it would be "dangerous" for the Fire Brigades Union to walk out for 47 hours starting on 5 November. London fire authority chairman has asked the FBU to "call the strike off" on the "busiest time" for the brigade. The Hindu, Jain and Sikh festival of lights, Diwali, also occurs that night. Earlier Fire Minister Bob Neill warned that the union had "shot themselves in the foot" with their choice of strike date but a London FBU official said it was more of a "symbolic night". More than 5,500 firefighters went on an eight-hour strike on Saturday over LFB's plans to scrap current rotas. The union plans to walk out for another eight hours on 1 November and for 47 hours on 5 November. The Prime Minister's spokesman said: "The public would not think this is a responsible way of conducting industrial action to choose this particular day for a strike. "We will be doing everything we can to ameliorate the effects of the strike, but we do not think it's responsible and I'm sure the public don't think it's a responsible course of action." Mr Miliband's spokeswoman said: "It would be a dangerous situation. "Hopefully it will be resolved by then. We would dearly like to see it resolved by then." On an average Bonfire Night, LFB said, the number of secondary fires or smaller fires are "five times higher than normal" while crews "attend twice as many primary (more serious) fires". Over the first 10 days of November 2009, LFB were called to a total of 860 fires, with the highest number of incidents, 224, taking place on Bonfire Night. London fire authority chairman Brian Coleman said: "The FBU have placed firefighters in a terrible position. "We had asked for a meeting with national negotiators on the 5 November, and the union have responded with a strike. The message to the FBU is short and simple. Call the strike off and talk." London Mayor Boris Johnson said: "There are solid contingency plans in place to deal with further firefighters strikes and Londoners should be confident that they can go ahead with their fireworks parties but, as always, take tried and tested precautions by following the Firework Code." Fire Minister Mr Neill said: "The choosing of 5 November, Guy Fawkes Day, for a strike is I think completely inappropriate, highly irresponsible and very provocative. "I believe they have shot themselves in the foot. "The very fact that there's that degree of uncertainty, whilst I'm sure it's deliberate on the part of those who chose this date, doesn't do anything I think to get them public sympathy." Later, in the House of Commons, he branded the firefighters' walkout as "reckless and cynical". 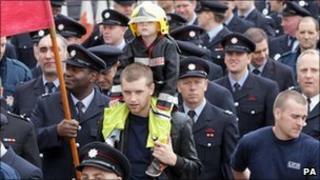 But Ben Sprung, London regional organiser for the FBU, told the BBC: "It's more of a symbolic night in my eyes. I can't remember a time when there was a mass display and people died there. "Maybe 20 years ago Bonfire Night was a big, really busy night but today I think it's a symbolic night more than a night where people's lives are in danger." Earlier FBU general secretary Matt Wrack said they "had two weeks to settle this dispute before that strike".